DESCRIPTION: When a particular topic has been covered by a great many very good books, a reviewer tends to start on a new book by considering why it is necessary. Of course, printed-paper books do go out of print and publishers go out of business, so some excellent books simply become unavailable except in the recesses of a second hand bookshop. There is also the march of technical development that requires a new author to revisit a group of topics and write an up to date book on the subjects. This book from Haynes is immediately recommended because of the reputation the publisher has established for well-illustrated practical manuals. Unsurprisingly, the author and publisher have followed the same layout as that used in their motor boat manual. It is a very effective approach and it also makes it much easier for the novice to buy both manuals when trying to decide where to start. 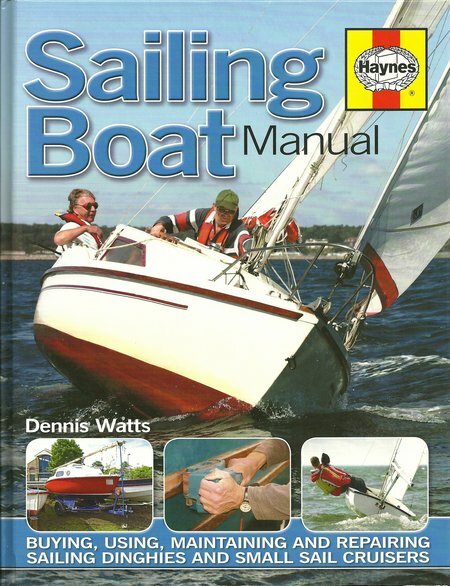 The author has been successful in covering the subject in a similar number of pages to those used for the motor boat manual because many sailing boats have all the functionality and equipment required in a motor boat with the addition of rigging and sail which adds another dimension. The basic entry level for sailing is the dinghy, which may not have a motor or the ability to mount one. The most basic dinghies are a simple moulded plastic hull, filled with buoyancy foam and may not even have a cockpit, the single sailor sitting on the deck. There may be a single sail attached to a mast that rotates. In such a vessel many children experience the thrill and pleasure of sailing for the first time, usually on sheltered inland waters. It can be the most convenient and economic way of getting afloat. From this starting point, the sailor may graduate to faster and more sophisticated dinghies. Modern designs are frequently unable to mount any form of engine because the hull has very low freeboard and a stern that is inadequate to take the weight and stress of even a small outboard. When the wind is unsuitable, the sailor has to rely on paddles or oars to reach a destination. This is no great loss because the dinghy provides an exciting competition vessel at an affordable price which can be used on inland and coastal waters. Once the sailor aspires to sea sailing, or wishes to spend days or weeks afloat, graduation to a cruiser is unavoidable and costs rise. Trailer-sailers are similar to small motor cruisers in size, can be towed home and from slipway to slipway. Although some sailors may not consider an engine essential equipment, this type of sailing boat is normally fitted out to mount an outboard motor. As the sailor graduates to larger craft, the engine may be fitted inboard and the craft is very similar to motor cruisers of the same size, with the addition of mast, sails and rigging. The author has covered these aspects adequately and the manual is easy to read and understand. A good staring point for any sailor and an ideal companion to the author’s motor boat manual.